Pashupatinath Tour – A pilgrimage tour to seven UNESCO designated world heritage site in Kathmandu. Himalayan Pilgrimage Journey offers the best Pasupatinath pilgrimage tour package in Nepal at most affordable rates! If you are planning your pilgrimage yatra in Pashupatinath, then you need not look further. We also offer pre-packaged tour for pilgrimage tour in Nepal, India and Tibet and customize the trip to make your pilgrimage tour special and personalized as per your needs. Dedicated to lord Shiva, Pashupatinath is one of the four most significant holy site in Asia for devotees of Shiva. The temple was built in the 5th century and later renovated by Malla King; this venerated site was believed to be existed from the beginning of the millennium when lord Shiva “Linga” was discovered here. Pashupatinath is located on the bank of the Bagmati River about 3km northwest of central Kathmandu. The temple is prohibited to non-Hindus but a fascinating view of temple and ongoing religious ceremony can be viewed from the vantage point located to the opposite bank of the river. The entrance fee of Pashupatinath temple is NRS 1,000 (10 USD). Don’t forget to bring your ID card or Passport or you may be restricted to enter other temples. Every day a fest 84 foods are prepared for Pashupatinath and 12 foods are offered inside the main temple to feed lord Shiva. The feeding process is done by chief Bhatta. On full moon day, the feast is offered to the public on the right hand side of the temple. Although the temple is embellished with fine art and woodworks, taking pictures are strictly prohibited here. It is not known exactly when the Pashupatinath was founded. There are many legends liked with the formation of the temple. It is believed that the temple was built on the site where Lord Shiva lost one of his antlers, while he was in the guise of a deer. Another myth claims that the site was founded by a herdsman whose cow showed the location of lingam by irrigating the place it was buried with her milk. The temple is a site where century-old religious ceremony are practiced, offering the pilgrimage or visitors to experience the unique spirit of Hindu tradition of life, death and reincarnation. 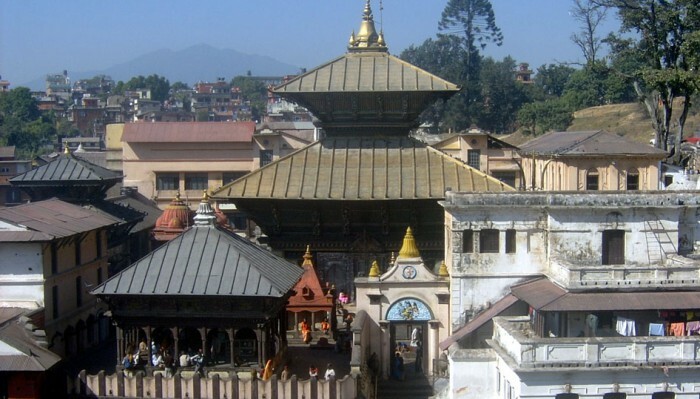 The main temple of Pashupatinath is made with a bunk roof and a golden spire. Located to the western bank of Bagmati, it is known for masterpiece of ancient Hindu architecture. The temple is in cubic shape with four main doors, all made with silver sheets. The temple is two-storied made of copper; topped with gold corn and stands 23.6m above the ground. The wood arts are highly fascinating which is amazing to explore. The both sides of each door are niches of various sizes with gold-painted of deities. Inside the temple is narrow ambulatory around the sanctum. The sanctum has Linga (1 m high) with four sides (Chaturlinga) and represents the Lord Vishnu, Surya, Devi and Ganesh. The priests operating the religious ceremony are called Bhattas and the main Bhatta is called Mool Bhatta or Raval. You can see the premises of temple decorated with wooden made members of Lord Shiva’s family – Parvati, Ganesh, Kumar, Yoginis and Hanuman, Rama, Sita, Lakshman and other gods and goddess. The open ground of Pashupatinath contains many other ancient and significant temples, shrines and statues. To the south of temple is Chadeshvar, 7th century Licchavi Linga and to the north is 9th century temple of Brahma. There is also Dharmashila, a stone where holy oaths are taken and you also can see statues of various Shah Kings. Likewise to the northeast corner of the temple is small pagoda temple of Lord Vasuki, the King of Nags. Legend has it that Vasuki settled here to protect Pashupatinath. You can see many pilgrims taking a Kora of Vasuki before going to the main temple. The Bagmati River located next to the Pashupatinath Temple is highly venerated sites for Hindu. The bank of river has bathing spots for the use of pilgrims. Arya Ghat, dating back to 1900s has special importance where members of royal families are cremated. Bhasmeshvar Ghatt is the place which is most used cremating site in the Kathmandu valley. Gauri Ghat to the north is preferred bathing site for women. Visitors can see 15 votive shrines, the Pandra Shivalaya which were built between 1859 and 1969 to enshrine Lingas in memory of deceased persons. You can also see Kali emerging halfway at the bank of the Bagmati River. It is said that, the statue is supposed to gradually emerge and once it comes out totally, it signals the end of the world. The evening Aarati with songs and dances is worth exploring in Pashupatinath. Devotees flock here to see the aarati. It gives you the pure feeling of spiritual attainment. Pashipatinath temple is major center to celebrate different kinds of festivals throughout the year. Hundreds of thousands of people join and enjoy the festival here. Maha Shiva Ratri Bala Chaturthi Festival and Teej festivals are most significant festivals to celebrate here. Many people from all over the world visits Pashupatinath during these festivals. We can meet many Sadhus at Pashupatinath Temple Complex. They have unique looks with unique paintings all over the body. Sadhus are ascetic yogis who are meditating to acquire liberation from the cycle of death and take a rebirth. Interesting thing about Sadhus is that, they are very friendly and love to pose picture with Tourists. Don’t forget to give some bucks! They live strange lifestyle in a holy cave or tiny cells on the territory of Pashupatinath. 10:00 AM – Pilgrims on Pashupatinath pilgrimage trip are welcomed to offer their prayers. The Puja continues till 1:45 PM. 6:00 PM – The Bagmati Ganda Aarati is performed by the bank of Bagmati. Mostly people visit to see Aarati in Saturday, Monday and special occasion. Pashupatinath temple lies about 3km northwest of Kathmandu city and it is close to the Boudhanath stupa and Tribhuvan International Airport (about 2km, approx. 10 minute drive). If you like to tour Pashupatinath, you can make combine trip to Boudhanath or visit Pashupatinath upon your arrival or just before departure. Upon your arrival in Kathmandu, our airport representative will receive you outside the terminal hall and transfer you to the hotel. Enjoy your free day at Thamel. Proceed for early morning visit to Pashupatinath with our expert tour guide on private cab/car. After darshan and puja, also visit Boudhanath and Swayambhunath. Drive back to the hotel and enjoy your time exploring the bustling city. Our airport representative will transfer you to the Tribhuvan International Airport for your final departure.